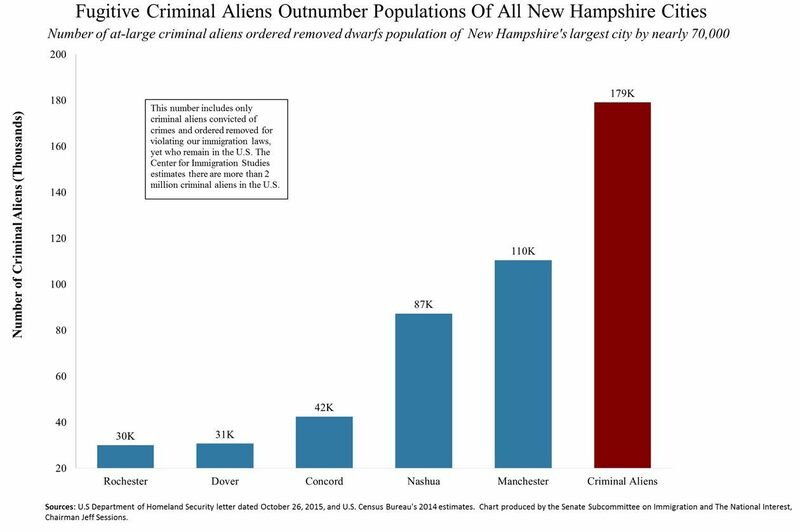 The Senate Judiciary Committee’s subcommittee on Immigration and the National Interest released a new chart on Thursday exclusively to Breitbart News that shows that the number of fugitive criminal aliens in America outnumbers the populations of every city in New Hampshire. According to data provided to the Subcommittee by U.S. Immigration and Customs Enforcement (ICE), there are at least 179,027 aliens in the United States who not only have been ordered to leave the country for violating our immigration laws, but who have also been convicted of a criminal offense, and have not left as required or been removed by ICE. Because of the Obama Administration’s lax enforcement policies, ICE removed only 63,539 of these criminal aliens from the interior of the United States in Fiscal Year 2015. At that rate, it would take nearly three years to remove just the existing criminal aliens who have been ordered removed from the United States (not future criminal aliens who will be ordered removed). While the ICE data includes only criminal aliens who have already been ordered removed, Jessica Vaughan, Director of Policy Studies for the Center for Immigration Studies, estimates there are more than 2 million total criminal aliens in the United States. The chart shows that the at-least-179,027 fugitive criminal aliens in the United States outnumber the populations of every single New Hampshire city. Manchester, New Hampshire, the most populous city, has 110,000 people — about 70,000 less people than fugitive criminal aliens in America — while Nashua has 87,000 people. Concord, New Hamsphire’s capital city, has 42,000 people and Dover has 31,000, while Rochester has 30,000. The subcommittee, which is chaired by Sen. Jeff Sessions (R-AL) — the intellectual leader of the modern conservative movement — has essentially proved that no matter where anyone in the first-in-the-nation primary state of New Hampshire lives, there are well more fugitive criminal aliens in the United States than the entire population of their home city. It will be interesting to see how this plays on the campaign trail in the final days.